Samuel Lubangakene is an 18-year-old Ugandan Ashoka Youth Venturer, who has developed a creative computer game project, called The Children Mind Development Project (CMDP). The initiative provides multiple brain training games, such as Sudoku, Space Chem and Braid, as well as computer training, including in game-making software, as an alternative to violent video games for local slum children. Samuel lives in the Acholi Quarter, a slum in Kampala, Uganda. This is an impoverish area, where most people survive by selling stone quarried from the area or making paper beads. During our interview, Samuel mentioned that the initiative started in 2013, when he realized that the slum children used the few Ugandan shillings they gained by collecting scrap metal or helping their parents with stone quarrying for 25 minutes of video games. The CMDP intends to provide slum children essential computer knowledge, which they can apply in their daily life and to improve their community. Samuel holds computer sessions twice a week for interested children.ed area, where most people survive by selling stone quarried from the area or making paper beads. The young Ugandan also hopes that, through the CMDP, he will be able to raise funds for the first community initiative he launched under the Butterfly project, called ‘Posho and Beans’ campaign. Samuel was part of the first “Pioneer” group of the innovative Butterfly project, which has been training young Ugandans from remote rural villages and disadvantaged urban slum districts to become social entrepreneurs, since 2009. 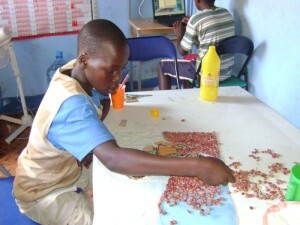 Under the Butterfly project, Samuel developed the ‘Posho and Beans’ campaign, aiming to change school meals by using art pieces made out of posho and beans, which is served as the daily school meal. For Samuel, this food is not only low in nutrients, but also repeatedly eating it has a negative effect on the children’s self-worth. With the help of a local professional artist, Samuel made a series of 12 pictures out of posho and beans, photographed in high resolution and put in a Calendar, where each photo is allocated a month, to raise awareness about the lack of nutrition in this staple food for Ugandan school children. He is still looking to ensure international sales for his calendar, which will enable him to present and distribute the calendar in primary schools throughout Kampala, while discussing the range of school food available, hopefully persuading schools to increase their lunch menus and provide balanced diets to their students. Samuel’s initiative has already inspired 4-5 primary schools to change their food policy, though many others are still resistant to change, as few realize the negative psychological impact of repetitive food. For CMDP, Ashoka selected Samuel as one of their Youth Venturers around the world. The Youth Venture program empowers young people to lead social change.The young Ugandan’s CMDP project has been licensed to access some games at no cost from Emblem Entertainment, an independent Australian game development company, established in 2008. The project has also gotten a Zone 40 wireless game system, which is an interactive gaming system with 40 built-in games and two motion controllers, which is similar to the Nintendo Wii. The CMDP has been so successful among local children that there are currently not enough computers to accommodate the demand. 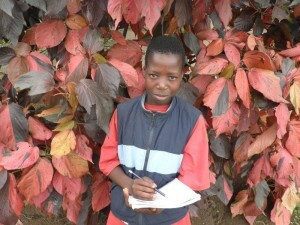 In terms of future plans, Samuel hopes to provide the children an income source, by getting them to type documents for local residents on computers, as well as help them set up bank accounts, where they can save their money.